When we reported two months ago that Ramon Ortega, principal oboe of the Bavarian Radio Symphony Orchestra, was leaving one of the best jobs in Europe to join the LA Phil, there was widespread bemusement. The BRSO is a virtuosic ensemble with elysian working conditions. Ramon, along with other principals, is required to work no more than 20 weeks a year. He can be on the ski slopes within half an hour of finishing rehearsal and on an Italian beach within an hour’s flight. Why give all this up for the smogways of Hollywood? Especially when you’re only 29. Maybe that’s why. ‘The orchestra is open to ideas that in Munich, for traditional reasons, are not carried out,’ he says. Read what else Ramon has to say here. If you don‘t like L.A. in your twenties, then you have no heart. If you still like L.A. in your forties, then you are a moron. Wow the concerto recording in the interview is wonderful playing. Congrats to the LA Phil for picking up such a fine musician! The usual America-bashing. He will be receiving a six figure (dollars) salary in Los Angeles. The ‘smogways’ are much cleaned up thanks to strict automobile emission controls mandated by the progressive government of the state of California. He is moving to perhaps what is the sunniest major city in the world, and leaving behind snow, gray skies, and damp. If he wants ski-slopes and beaches, the former are a few hours’ drive, and the latter can be reached in less than an hour. His native Spanish is a second language, in New World forms. He’ll have to work more than 20 weeks in the orchestra, but he will also have ample opportunity to earn outside income, as his upcoming postion in the Colburn school indicates. I can only report what I observe, but principal players in major US orchestras do not participate in every program – in Los Angeles there are perhaps thirty such programs, offered on a weekly basis. Also, the major city most likely to catch on fire. Also, with a much higher murder/gun violence rate than any major European city. Not to mention income inequality, poverty, urban sprawl, the list goes on. Take your rose coloured glasses off. In California, that’s the rate for individuals making over $524,000, and it’s actually 12.3%, not 13. ………..and no longer deductible against Federal Tax courtesy of “the administration”……………. He could make a killing in the recording industry. And it keeps paying residuals twenty years + later. No idea what he earns in Munich but I could see him earning close to $500k/year in LA. A couple years ago the LAPO principal bassoon was earning about $325k (probably more now), and you’d think a principal oboe – signed away from the BRSO – could get at least as much. Plus teaching, other performances, some studio recording? And he’s probably just set himself up as the most visible oboist in the business. Still wouldn’t choose LA over Munich myself, but I can see the attraction. BRSO is about 100k € for a solo player, 120k US$ at current exchange rates, max. Probably less. It‘s public service after all. Base for him is just shy of €90.000 (pre-tax) per year. It seems to me that there may be 2 reasons for such transatlantic flight: 1) LA is farther removed from Russia and 2) Munich is satisfied with music and doesn’t need any additional thrills, which may be a bit boring for a young musician. He is a great player.But i am not sure if his sound fits in the LA Phil. Well, maybe you aren’t sure, but the LA Phil, who doubtless heard him in several auditions, and perhaps had him play some concerts in Disney Hall, apparently is. I’d like to add a little new perspective to this. I too was at first on the side of scratching my head over why LA Phil would hire a German school oboist. But if you take the effort to look at the history of orchestras in the United States in the first half of the twentieth century you will find something quite interesting. Take the story of Marcel Tabuteau for example. When he arrived in the United States in 1905 to play for Walter Damrosch and the New York Symphony he complained how it was difficult to play alongside his German colleagues. So oboists, imagine a French player sitting alongside a German player. It didn’t seem to bother Damrosch. Consider also how this “cross pollination” influenced Tabuteau. And in many ways Tabuteau described his method as a mixture of German dark sound with the flexibility of French style reeds. But the point being that many US orchestras, even the ones still in existence, had both German and French players in their ranks before Tabuteau’s “American” style took hold as the status quo, which I would guess wasn’t really until post-WWII. 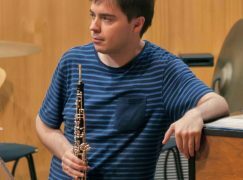 Roman Ortega will not be the first European oboist to play in the L.A. Philharmonic. Henri de Busscher, a Belgian, played principal oboe there from 1920-48. His playing inspired a very young Ray Still, a volunteer usher for the LAPO, to switch from clarinet to oboe. Doug: Don’t forget the Italians. They also made a great contribution to American woodwind playing. I shouldn’t think, however, that there really existed an Italian school or style of playing. Am I wrong? “So oboists, imagine a French player sitting alongside a German player. ” Sounds like the BRSO before Ramón Ortega with François Lekeux and Stefan Schilli. Sorry for the typo: Leleux, of course. I’ve been to Munich. The air was brown. If skiing is the issue, there is substantial skiing in California, even southern California. Better orchestra, better looking women, much more interesting food, much better weather, bad traffic…well, the young man will almost have it all. Better orchestra? Have you heard them live with Mariss Jansons? They play like a dream, an incredibly wide range of dynamics and expressions, always listening to their colleagues, and being completely on the same page with Jansons’ musical vision – like a perfect marriage. They give the Berliners a run for their money as the best orchestra in Germany. Don’t get me wrong: the LA is an excellent orchestra, but the BRSO is quite something else. Except for the weather, all your other points are moot. Better looking women? If you like plastic maybe. In any case, much sexier than the real thing. The idea that the LAP is a “better” orchestra than the BRSO is laughably if you listen to both of them regularly. The LAP isn’t even better than the Munich Phil. If the US orchestras are paying anywhere near $500,000 for a principal player, that might help to explain why they are in such desperate situations financially. That is ridiculous! How do you listen to both orchestras regularly? Their tours have little overlap as far as I can tell. More like $300k for a principal. The LA Phil is not in any kind of desperate financial situation. Your opinion is in conflict with the publicly available info at their website. Anyway, you can’t compare the German system of subsidies with the free market and the resulting salaries. Take for instance the principal trumpet. He was invited as guest principal of the NY Phil and the Chicago Symphony. I’m sure he negotiates his salary and it reflects his standing in the field. Thats the free market system at work. The BRSO can’t match the LA Phil in flexibility of style and comfort with a wide range of repertoire. Of course, I can’t prove that assertion; and maybe they can. But the LA Phil has long been known as a stylistically flexible. What you can’t argue with is that the player thinks it is a step up or he wouldn’t do it. I’m only guessing at how it could be viewed as a better position. But the posters here who argue that LA is a step down, are proven wrong by virtue of the fact he is going there therefore perceives it as a step up. By the way, I’ve heard the Munich Phil in their hall and the LA Phil in Disney. LA was another level up, to my ears. Munich Phil is an entirely different orchestra. Mr. Ortega is leaving the BRSO which doesn’t have a hall of their own at this point yet. There is one in the making, though, but whether it will be comparable to Disney Hall one may have doubts. Having an excellent hall is certainly an important asset for an orchestra, but I would still try to differentiate between the qualitiy of the orchestra and the quality of the hall. Sure, the LAP is better at things like Copland, Gershwin, Bernstein, maybe even Stravinsky, but they aren’t even close when it comes to the German masters. Depends on the conductor and the era. Mahler and Bruckner when Mehta was the MD was better than “close”. If you missed it, check out the CDs. Brahms with Guilini, ditto. Your opinion not withstanding and without wishing to engage in a subjective LA Phil vs BRSO contest, a player choosing to switch to a new orchestra doesn’t automatically mean it’s “a step up” in terms of an orchestras’ abilities or the salary. See Julien Beaudiment who left the LA Phil for the Orchestre de l’Opéra de Lyon, an orchestra that cannot keep up with the LA Phil in terms of salary and recognition/prestige. I know. I was pointing out that players can have a variety of reasons for switching orchestras that have nothing to do with it being ‘a better orchestra’ in general and that a player going from one top orchestra to another doesn’t necessarily signify that the new orchestra is a step above the old one. He is an elite musician with options and not some stiff pulling up stakes because the plant shut down. 20 weeks a year with the LA Phil still leaves him 32 weeks to live, concertize, and teach wherever he likes – including back in Europe. He will be well compensated and can have as much mobility as he wants. I look forward to hearing him during his time here. He will certainly have to work with the orchestra considerably more than 20 weeks a year if he becomes LA Phil principal. That is certainly possible, but I was just pointing out an erroneous implication in the comment to which I was replying. In any case, most young and healthy “star” musicians who are interested in continuing their active solo and/or chamber careers may actually prefer agreeing to a fuller orchestral workload if that would allow them to spend fewer weeks fulfilling their contractual obligations as principals in order to have more time available for their (worldwide) outside activities.